sweet | Scent Addicts - Perfume reviews, fragrance news, & more! I have always wanted to try Philosophy products; whenever I see the body lotions and shower/bath gels in the store, I admire them from afar, but I never made the plunge and actually tried any… until I received a Sephora gift card for Christmas, that is. Flowerbomb may just be THE most popular fragrance of the decade, and for no other reason, I decided I would try it. I have seen it described as a chiefly gourmand scent, while others classify it as a “pink” floral, yet some others say it is a modern floriental. I had absolutely no expectations, so no matter what I thought of it, I was not to be disappointed. All celebrity jokes aside, the original Paris Hilton fragrance is one of my favorite perfumes, ever. I took it upon myself to sample her collection, and Heiress was the second fragrance I purchased in her line. While I was not nearly as impressed with Heiress, I wasn’t terribly disappointed, either. NOTES (as listed on sephora.com): Green Ivy, Tangerine, Water Lily, Orange Flower Petals, Moroccan Rose, Jasmine Sambac, Riviera Mimosa, Apricot Skin, Amber, Woods, Musk. 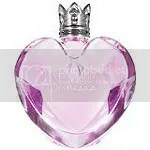 I had tested the original Vera Wang Princess, but was not impressed; for one thing, I was not expecting a floriental fragrance from something that was marketed for an extremely young age group. I read about Vera Wang Flower Princess, and was intrigued. Supposedly, Vera Wang created this fragrance for the Japanese market, which likes lighter, sweeter fragrances according to the review I read. As a result, Vera Wang Flower Princess became available for a limited time in the United States, and I took the plunge before it was too late. CLASSIFICATION: Soft, feminine, and flowery.